A selection of key titles for learning more about how the changing climate is affecting processes that determine how the planet's oceans function. Oceans cover about 71 percent of Earth’s surface. Since the start of the Industrial Revolution, they have provided the single largest sink for the carbon dioxide released by the burning of fossil fuels. And they have absorbed much of the heat that resulted from the increased atmospheric concentrations of greenhouse gases that they did not capture. But the climate-driven impacts that the oceans can have on land, through extreme weather and rising sea levels, have received much more attention than the direct impacts the changing climate is already having on the physical, geological, chemical, and biological processes that determine how oceans function. This bookshelf attempts to remedy that neglect. 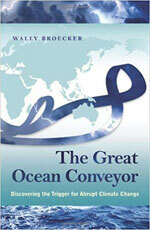 After noting three overviews, this selection highlights books on ocean circulation systems; the oceans’ role in Earth’s climate, marine biochemistry in general and ocean acidification in particular; and the need to develop new technologies and new modes of governance to manage changes humans have unwittingly triggered in the blue waters that made this planet green. The descriptions are adapted from copy provided by the publishers. 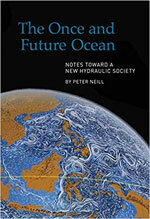 In recent decades we’ve learned more about the ocean than in all previous human history combined. But even as our knowledge has exploded, so too has our power to upset the delicate balance of this complex organism. 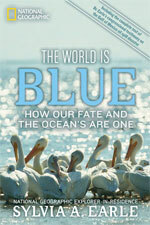 Legendary marine scientist Sylvia Earle portrays a planet teetering on the brink of irreversible environmental crisis. Modern overexploitation has driven many species to the verge of extinction. Since the mid-20th century about half our coral reefs have died or suffered sharp decline. And toxic pollutants afflict every level of the food chain. Fortunately, there is reason for hope. The ultimate goal, Earle argues passionately, is to find responsible, renewable strategies that safeguard the natural systems that sustain us. The sea feeds and sustains us, but everywhere we look marine life is under threat. In this passionate paean to the sea and its creatures, one of the world’s foremost marine conservation biologists tells the story of man and the sea, from the earliest traces of life on earth to the oceans as we know them today. He considers the impact of fishing and ocean acidification, rising tides and warming seas, plastics and shifting currents, and reveals what we must do now to preserve our precious oceans. The struggles of turtles, dolphins, whales and tuna are relatively well known, but few people appreciate just how much our seas have changed in the last fifty years and how many species are now under acute stress. More than two decades ago, Wally Broecker discovered the link between ocean circulation and climate change, in particular how shutdowns of the Great Ocean Conveyor – the vast network of currents that circulate water, heat, and nutrients around the globe – triggered past ice ages. In The Great Ocean Conveyor, Broecker introduces readers to the science of abrupt climate change while providing a vivid, firsthand account of the field’s history and development. He describes the men and women behind the science, and reveals how his own thinking about abrupt climate change flip-flopped as new evidence has emerged. Rich with personal stories and insights, The Great Ocean Conveyor opens a tantalizing window onto how Earth science is practiced. The oceans exert a vital moderating influence on the Earth’s climate system. They provide inertia to the global climate, essentially acting as the pacemaker of climate variability and change, and they provide heat to high latitudes, keeping them habitable. 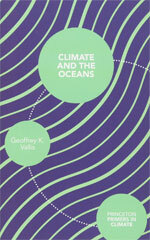 Climate and the Oceans offers a short, self-contained introduction to the subject. This illustrated primer begins by describing the world’s climate system and ocean circulation and goes on to explain the important ways that the oceans influence climate. Topics covered include the oceans’ effects on the seasons, heat transport between equator and pole, climate variability, and global warming. The book also features a glossary, suggestions for further reading, and easy-to-follow mathematical treatments. Marine geochemistry uses chemical elements and their isotopes to study how the ocean works in terms of ocean circulation, chemical composition, biological activity and atmospheric CO2 regulation. This rapidly growing field is at a crossroad for many disciplines (physical, chemical and biological oceanography, geology, climatology, ecology, etc.). 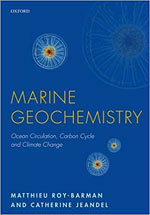 This text introduces the core concepts, the methods, and the applications of marine geochemistry, with a particular emphasis on isotopic tracers. Introducing a very large number of topics (physical oceanography, ocean chemistry, isotopes, gas exchange, modelling, biogeochemical cycles), with a balance of didactic and in-depth information, Marine Geochemistry provides both an outline and a complete course. In Seasick, veteran science journalist Alanna Mitchell dives beneath the surface of the world’s oceans to give readers a sense of how this watery realm can be managed and preserved, and with it life on earth. Each chapter features a different group of researchers who introduce readers to the importance of ocean currents, the building of coral structures, or the effects of acidification. With Mitchell at the helm, readers gather sea sponges that may contribute to cancer care, see firsthand dead zone in the Gulf of Mexico, and witness the simultaneous spawning of corals under a full moon. 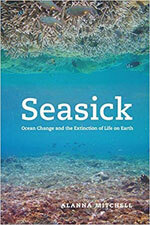 The first book to look at the planetary environmental crisis through the lens of the global ocean, Seasick urges reverence for the fount from which all life on earth sprang. The Washington Journal of Environmental Law and Policy, a journal produced by law students and dedicated to the advancement of interdisciplinary scholarship in the field of environmental law, is proud to present this special issue dedicated to the critical topic of ocean acidification. 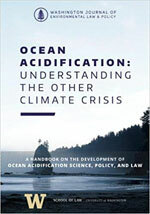 Featuring scholarship by professionals in fields ranging from conservation and marine sciences to environmental law, this handbook aims to equip legal practitioners with a comprehensive understanding of the complex issues presented by ocean acidification. This issue features analysis of domestic and international legal schemes, including the Clean Air Act, the public trust doctrine, and federal treaty and trust-created obligations to American Indian tribes. The ocean helps moderate climate change thanks to its considerable capacity to store CO2, through the combined actions of ocean physics, chemistry, and biology. This storage capacity limits the amount of human-released CO2 remaining in the atmosphere. As CO2 reacts with seawater, it generates dramatic changes in carbonate chemistry, including decreases in pH and carbonate ions and an increase in bicarbonate ions. The consequences of this overall process, known as “ocean acidification,” are raising concerns for the biological, ecological, and biogeochemical health of the world’s oceans, as well as for the potential societal implications. 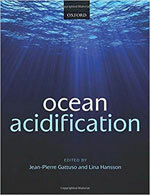 This text synthesizes the very latest understanding of the consequences of ocean acidification, with the intention of informing both future research agendas and marine management policy. 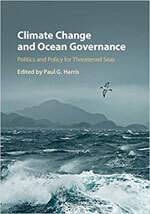 Climate Change and Ocean Governance examines the political and policy dimensions of climate change for our oceans. The environmental, social and economic consequences of oceanic change present tremendous challenges. New and innovative policies for governing oceans and seas – and for managing vital marine resources – have never been more important. But existing national and international institutions that were created when oceanic conditions were relatively static may not be adequate for a future characterized by continuous oceanic change. This book reveals the unavoidable connections between climate change, the oceans, and questions of governance, and it provides valuable lessons for researchers, policymakers and activists. 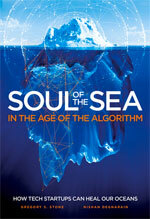 This publication draws upon the fields of science, economics and business strategy to chart the future of humankind’s relationship to the ocean. A healthy ocean provides the basis for a prosperous world, and oceans have been largely ignored as a driver of human well-being until now. Ocean health has been in a serious state of decline for the past 100 years from a range of pressures including human population growth, energy consumption and use of natural resources. Humanity will exceed the resources and environmental conditions necessary to exist, within the next century if nothing changes. Solutions to these challenges lie not only in traditional resource conservation management, but in new fields of technology, governance and innovation. 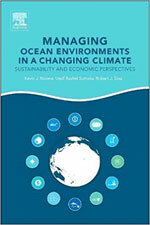 Managing Ocean Environments in a Changing Climate summarizes the current state of several threats to the global oceans. What distinguishes this book most from previous works is that it focuses, holistically, on the global-scale for the first several chapters and then provides an example of how this approach can be applied on a regional scale, specifically the Pacific region. Engaging leading scientists in a number of areas, such as fisheries and marine ecosystems, ocean chemistry, marine biogeochemical cycling, oceans and climate change, and economics, the editors examine the mounting threats to the oceans, provide gross estimates of the economic and societal impacts of these threats, and deliver high-level recommendations. 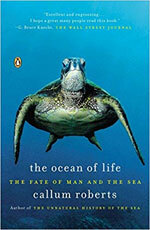 Editor’s note: Readers who want to explore this topic with their children can turn to three recent titles: The New Ocean: The Fate of Life in a Changing Sea, by Bryn Barnard (Penguin Random House 2017, 40 pages, $18.99); Fever in the Oceans, written by and illustrated by Stephen Aitken (Looking Glass Library 2011, 32 pages, $28.50); and Rising Seas: Flooding, Climate Change, and Our New World, by Keltie Thomas (Firefly Books 2018, 64 pages, 9.95 paperback).